Dirty cops Rod Rosenstein and Robert Mueller indicted 12 Russian military officials on the eve of President Trump’s meeting with Russian President Vladimir Putin. The Deep State is DETERMINED to ruin Trump’s historic meeting with Putin and embarrass the American leader. And just like clockwork, top Democrats started calling for Trump to cancel his Putin summit. 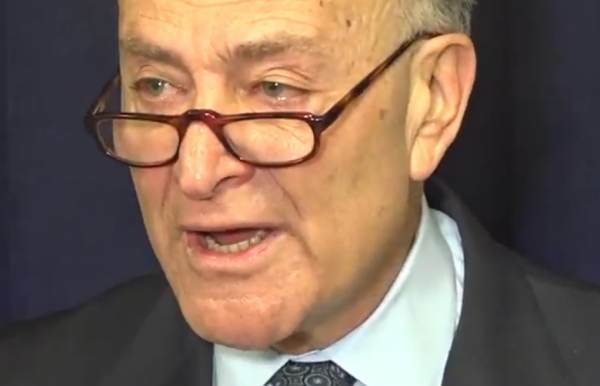 Senator Chuck Schumer (D-NY) hammered the President over his scheduled meeting with Putin, reports Fox News. The sleazy Vice Chairman of the Senate Intel Committee, Mark Warner offered Trump an ultimatum: make Russian interference a priority or cancel the meeting altogether. Sen. Mark Warner, top Democrat on the Senate Intelligence Committee, offered Trump an ultimatum for the highly anticipated summit: make Russian interference a priority, or cancel the meeting. Other Democrats said Trump should nix the summit regardless — though they were raising concerns about the meeting even before the indictment. Chuck Schumer immediately called for Trump to cancel his meeting with Putin. Liberals on social media were whipped up into a frenzy saying if President Trump meets with Russian President Vladimir Putin, he should be charged with treason. The so-called ‘Russian interference’ took place under the Obama administration and nothing was done about it. Rosenstein confirmed in a press conference Friday that the DNC server wasn’t hacked, Podesta’s emails were supposedly obtained through a “spear phishing” scam. DAG Rosenstein also said there is no allegation in this indictment that any American citizen committed a crime. “There is no allegation that the conspiracy changed the vote count or affected any election result. The special counsel’s investigation is ongoing,” Rosenstein said. Mueller’s indictment is another ruse to continue to attack a duly elected president; the special counsel should be immediately shut down and all involved in the attempted coup should be prosecuted and put in prison.